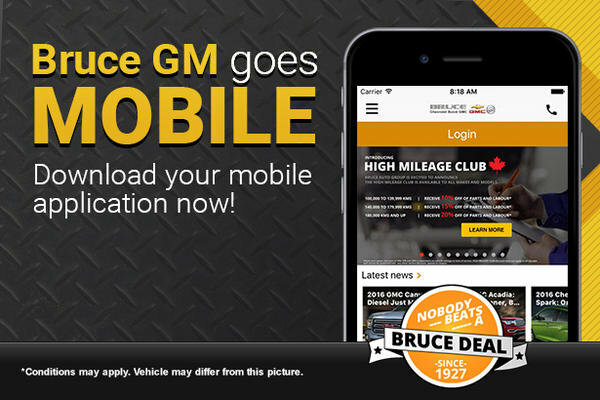 Home > Headlines > News > Bruce GM Goes Mobile! While you can quickly and easily search our entire inventory of new and used vehicles, you also get access to a number of more advanced features, designed to keep you and your vehicle up-to-date in the mobile age! The future has arrived at Bruce Auto Group, and you’re invited! This month, Bruce Automotive Group will be rolling out its state-of-the-art mobile applications for its flagship dealerships: Bruce Ford, Bruce Honda, and Bruce GM in Middleton & Digby. With our mobile apps, you’ll get access to Bruce’s unbeatable deals – and more – from the convenience of your iOS or Android device. Plus, with our mobile app, you can create a profile and register your existing vehicle to gain access to even more great features. While you can quickly and easily search our entire inventory of new and used vehicles, you also get access to a number of more advanced features, designed to keep you and your vehicle up-to-date in the mobile age! When you create a profile on one of our apps, we can use information about you – such as where you live, what make of vehicle you own, etc. – to send you special promotional offers that are customized based on your interests! That way, you’ll only receive notifications when a promotion relevant to your situation appears! Here at Bruce, we know that accidents happen. That’s why our new app allows you to access roadside assistance in case of an accident or breakdown. If you’re stranded on the side of the highway with a flat tire and no spare, simple pull up the app on your smartphone or tablet, tap the assistance icon, and we’ll direct you to the best solution to get you back on the road and toward your destination. Scheduling Maintenance has Never Been Easier! Plus with our app, you’ll never forget about an appointment for an inspection or tune-up again! Through the application, you can receive push notifications to your phone to remind you about upcoming service appointments, regular scheduled maintenance, and inspections. Plus, you’ll be able to book, reschedule, and cancel service appointments with the tap of a finger! With Bruce Auto Group’s mobile apps, keeping on top of your vehicle’s maintenance schedule has never been easier with Bruce Automotive’s mobile apps. So if you’re looking for a high-quality new or used vehicle, or if you have one already, download the Bruce Ford, Bruce Honda, or Bruce GM app today, create your unique personal profile, and start taking advantage of our fantastic opportunities to save! Because remember – nobody beats a Bruce deal!